The Hebrew expectation in Jesus’ day centered on Rome – particularly the purging of Roman authority from Jerusalem, thus restoring the throne of David forever. But it seems the rabbis of Jesus’ day failed to put Isaiah 53 at the center of their expectations of the Messiah. The passage describes a servant – but the Messiah is supposed to be a king? What do we do with that? So when Jesus shows up as a lowly king, almost everybody misses it. To say that Jesus is the Messiah is to say that He is the fulfillment of every prophecy, every promise that God has ever made to deliver His people. They all come to fruition here in the person of Jesus. Paul says it this way in 2 Cor. 1:20, “For no matter how many promises God has made, they are ‘Yes’ in Christ.” And the Hebrew writer extends this by saying that the covenant we now have in Jesus is superior because it is built upon better promises (Heb. 8:6). So now, we begin to put all our names together: God Saves and God is With Us through His Anointed One, His Promised One. But there is one more title the angels ascribe to Jesus in their announcement to the shepherds. And it might be the most important one of all. In Jesus’ day, there was only one person who held the title “Lord” in the minds of most people and that was Caesar. “Caesar is Lord” was the common parlance of the Roman Empire. It might be difficult for us to imagine just how controversial this statement would’ve been in the ancient world. 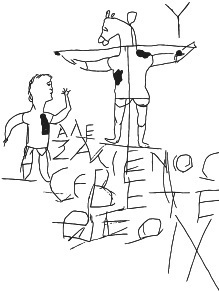 It is commonly believed that this ancient street art is ridiculing the Christian faith, a belief that brazenly defied the prevailing worldview of the day (“Caesar is Lord”) with the audacious claim that a Galilean peasant murdered for insurrection was actually somehow divine. This is what Paul meant when he wrote: For the word of the cross is folly to those who are perishing, but to us who are being saved it is the power of God (1 Cor. 1:18). The world has always been antagonistic toward those who would make the claim that Jesus is Lord. When the soldiers went out to incarcerate him, they got to his home in the evening and he opened the door; he was a kind, gentle man, already well up in years, 86 years of age. He welcomed them into his home. He asked them, “Have you had anything to eat?” He offered them food and drink, and he said, “Please, allow me time to pray, it’s too late for us to travel back and I will go with you peaceably.” So Polycarp took care of his guards, and he went upstairs and he prayed fervently that night and then he came down. Again the judge insisted, promising that if he would swear by the Emperor and curse Christ he would be free to go, but Polycarp replied, “For eighty-six years I have served Him and He has done me no evil. How could I curse my King who saved me?” When the judge threatened him with burning him alive Polycarp simply answered that the fire that the judge would light would last only a moment; whereas the eternal fire would never go out. Finally, after he was tied to the post in the pyre, he looked up and prayed out loud, “Lord, Sovereign God, I thank you that you have deemed me worthy of this moment, so that jointly with your martyrs I may have a share in the cup of Christ. For this I bless and glorify you. Amen. This is what it means to confess the lordship of Jesus! Lord: it is the name by which all creation will someday know Jesus. Therefore he has exalted him to the highest place and gave him the name that is above all names, that at the name of Jesus every knee will bow and every tongue confess that Jesus Christ is Lord to the glory of God the Father. God Saves and God is With Us through His Anointed One. Will you make Him your Lord? This entry was posted in Devotional, Faith, Jesus, Scripture, The Story, Theology. Bookmark the permalink.